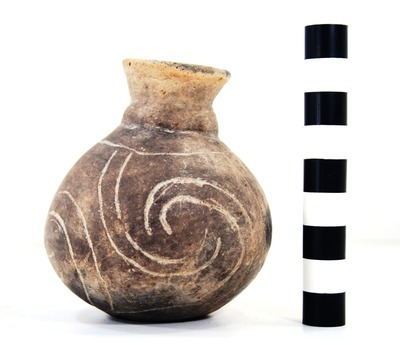 "41HS261, 2003.08.46, Burial 5, Vessel 16" by Timothy K. Perttula and Robert Z. Selden Jr.
DECORATION (INCLUDING MOTIF AND ELEMENTS WHEN APPARENT): The vessel body has four vertical to curvilinear engraved scrolls (in sets of two lines) that end in hooked arm elements (see also Jones 1968:Plate 25h). Taylor Engraved spool-neck bottle, Burial 5, Vessel No. 16, J. O. and Henry Brown site.